Have you ever cooked with tea? 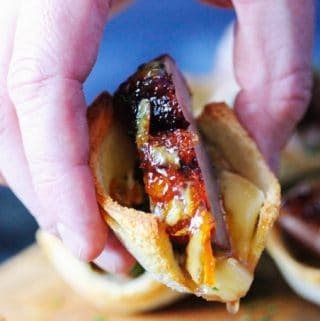 I created this amazing recipe for Tea Infused Orange Duck Bites with Brie Cheese to show you how versatile and amazing tea be can be as a cooking ingredient. 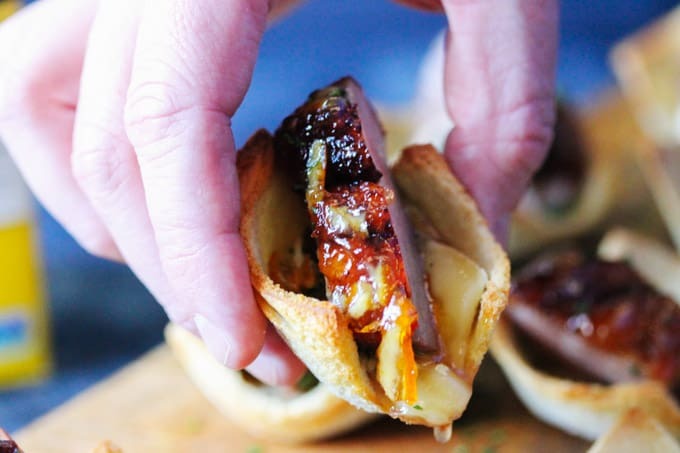 This recipe is submitted for a bloggers’ challenge. If I win, I’ll get a monetary prize (please keep your fingers crossed!). So, I received Stash Tea samples to create this recipe and I must say the outcome was absolutely out of this world delicious! As a matter of fact, in the midst of the guttural noises my husband was making, he professed that it was THE BEST appetizer he has ever eaten. You may think that this is a fancy appetizer and probably requires a lot of work, but actually, it’s not that difficult at all. It will require a little planning ahead of time but the result is totally worth it and it packs plenty of that WOW factor. It can be served for Easter (which we’re currently approaching), or any other special occasion for that matter. 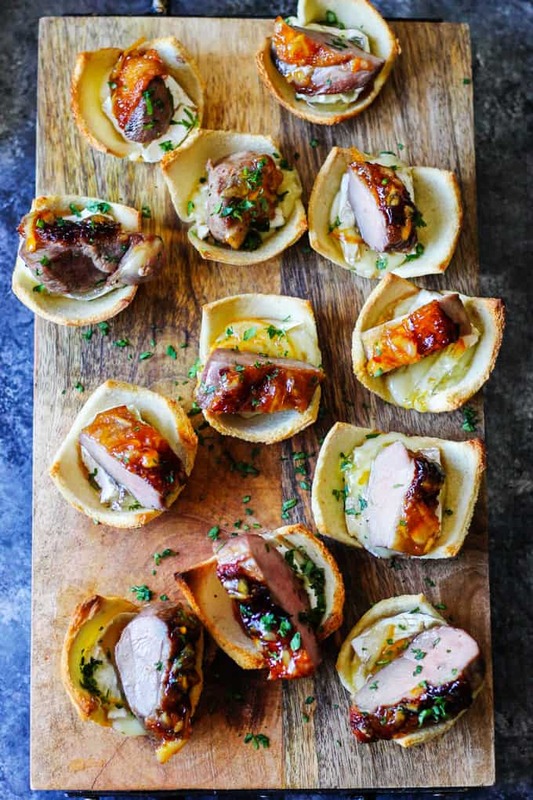 These Orange Duck Bites not only look amazing, but they also taste really outstanding (I wasn’t kidding when I said that my husband declared that this was the best appetizer ever). Mind you, he is a huge duck fan so I guess that could’ve clouded his judgment, but he never tried duck that was infused with tea. And that really makes a huge difference! In the next section, I’ll show you how I used Lemon Ginger Stash Tea to infuse this duck (spoiler alert: I used Stash tea twice in this recipe) and why it makes such a huge difference. What is Needed to Make Tea Infused Orange Duck Bites? Duck breasts cook fairly quickly (it takes about 18 minutes of cook-time and 10 minutes rest-time). They are very flavorful and tender. My special technique shows you how to make a duck breast with perfectly crispy skin and very tender duck breast meat (the tea has something to do about that). Orange Marmalade was my obvious choice. Orange and duck go hand-in-hand. I’m sure you’ve heard about the famous French dish “Duck l’Orange”, and this is where the inspiration for this dish comes from. Lemon Ginger Stash Tea was my tea choice for this bloggers challenge. I received samples of 3 different types of tea: Lemon Ginger, Premium Green, and Chai Spice. I decided to use the Lemon Ginger Tea and I infused my duck with it too. You’re probably anxious to know how I used this tea and here is the big reveal. As mentioned above I used it twice. First, I brined the breast overnight in a solution of Lemon Ginger Tea, Salt, and Brown Sugar. Then I made a spicy Lemon Ginger Tea and Orange Marmalade glaze to top the crispy duck with. I created a step by step tutorial below to show you how to make this amazing Tea Infused Orange Duck Appetizer. I chose white bread for this recipe for a few reasons. First and foremost, it created a perfect vehicle for this appetizer. It’s quick to get toasted, easy to work with and easy to eat. 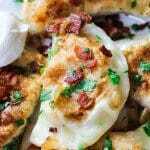 I tested this recipe a few times and one of the alternatives I used were wonton wrappers. They looked pretty (I must admit), but they were not easy to eat with. As a matter of fact, my husband hurt the inside of his mouth with sharp edges. So this option was out of the question. I tested white bread with different options, and I decided to roll out my bread to make thin. Thicker slices were breaking when pushed into a muffin tin. The alternative would have been to cut out rounds of bread with a glass, toast them and then follow the rest of the recipe. But I really like how my rolled white bread turned out. I then used Brie Cheese to balance out both the sweetness of the marmalade and spiciness from the chili flakes with a touch creaminess and saltiness from a famous French cheese. It really worked spectacularly. How to Make this Orange Duck Bites Appetizer? You will need to combine all the brine ingredients and let them cool off. Then place the duck breasts into a Ziploc bag, pour in the brine, close it, place in a bowl, and refrigerate overnight. The next day you will have to remove the duck breast from the brine a few hours before cooking. Place them onto a plate to the refrigerator, uncovered, to let the skin dry (this is an important step if you want to achieve a crispy skin on your duck breast). Start by preparing your glaze. You will need to steep 1 tea bag of Stash Lemon Ginger Tea in half a cup of water. To the saucepan add the tea. Add half a cup of orange marmalade, add a pinch of salt and a pinch of red pepper flakes (the number of pepper flakes will depend on the spiciness that you want to have, I added approximately 1/4 teaspoon, but we like spicy food. If that’s not you, then start with a small pinch, once your glaze is ready you can always adjust the spiciness by adding more flakes). Cook it for approximately 15-20 minutes on low heat, until the glaze sticks to the back of your spoon and most of the liquid has evaporated (by the way, this glaze is really amazing; it’s sweet, spicy and infused with Lemon Ginger taste of Stash Tea). How to Cook Duck Breast? This technique for cooking duck breast will allow you to achieve a crispy skin while not compromising the tenderness of the meat. Step 1: The brining is critical for this recipe because you need to cook the breast to more medium internal temperature rather than a rare or medium-rare. And here’s why… After your breast rests for 10 minutes and you cut it, to place into individual bites on the bread with brie cheese, you can’t have blood dripping down the cheese. There’s nothing appetizing about that. But you still want the meat to be super tender. And this is where tea brine makes a HUGE difference. Please don’t skip this part or you will not achieve the effect as I did here. Step 2: Removing the duck breast from the brine and letting the skin dry in the fridge is another super important step to help achieve a crispy skin (don’t skip that part either). Step 3: Scoring the duck skin is the third super important step. First, be careful to only score the skin but not the meat. You need to do this in order to let the fat render out from the skin. If you skip this step you will end up with chewy, soggy duck skin (and nobody wants that!). 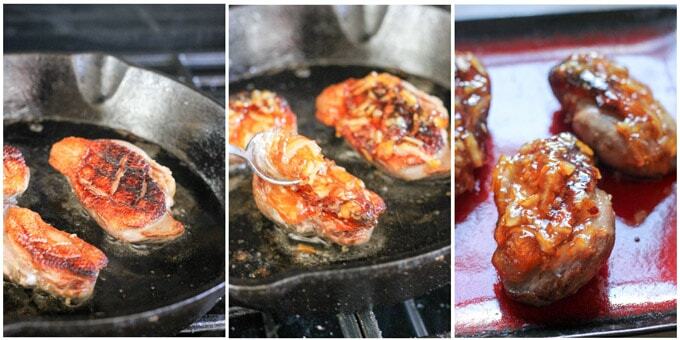 Step 4: Place your duck breast skin side down on a cold, cast iron or stainless steel skillet. Yes, you heard me right. The skillet needs to be cold! I know this is counterintuitive and is a totally opposite of any technique you’ve used to cook meat but it really WORKS! Preheat the oven to 400 F. Turn the heat on your stove to medium and set a timer for 12 minutes (if your breasts are less than a 1/2 lb, but if they weight more than you can set a timer for up to 15 minutes). Do not touch the meat for the entire time. Once the timer is up, flip the meat and cook on the other side for 1 minute. Smother each breast with Lemon Ginger Tea Orange Glaze and place it in the oven for 5-6 minutes (under 1/2 lb for 5 minutes, over 1/2 lbs for 6 minutes). Remove from the oven and let it rest for 10 minutes before carving. How to Assemble this Orange Duck Bites Appetizer? When your duck is cooking, start preparing the bread vehicles. Cut each white slice of bread in half, then remove the crust and, using a rolling pin, lightly roll each piece down. Spray the regular muffin tin with a cooking spray. Place each piece of bread in one muffin hole, gently pressing them down and spray the bread with cooking spray as well. Once your duck is out of the oven and resting, then place the muffin tin in the oven and bake for 8 minutes. In the meantime cut your brie cheese into squares so they can fit into the bread vehicles. Remove the muffin sheet out of the oven, add cheese squares to each bread cup, place it back in the oven and bake for another 5 minutes. Slice up your duck breast. Remove the bread from the oven. Add 1/2 a teaspoon of orange marmalade to each, top it with Lemon Ginger Tea Orange Glazed Duck Breast slice; sprinkle all with some parsley and serve. Enjoy! 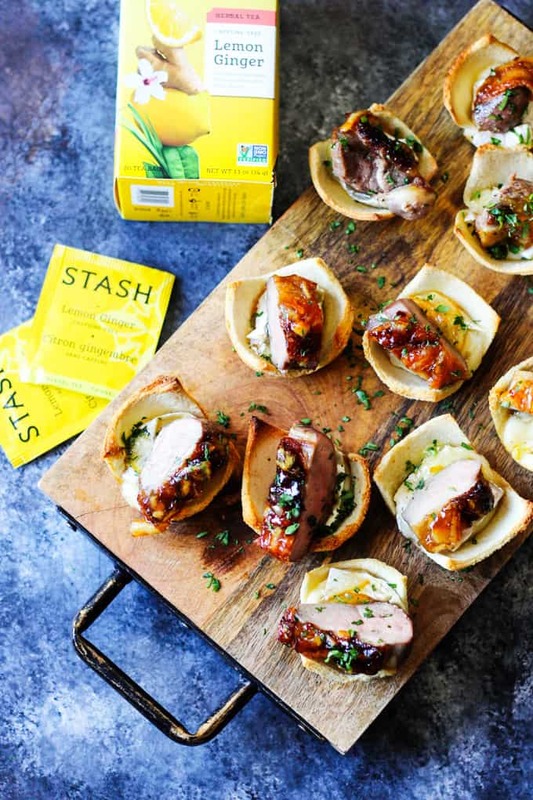 Tea Infused Orange Duck Bites with Brie are a perfect appetizer for Easter or any other Holidays. 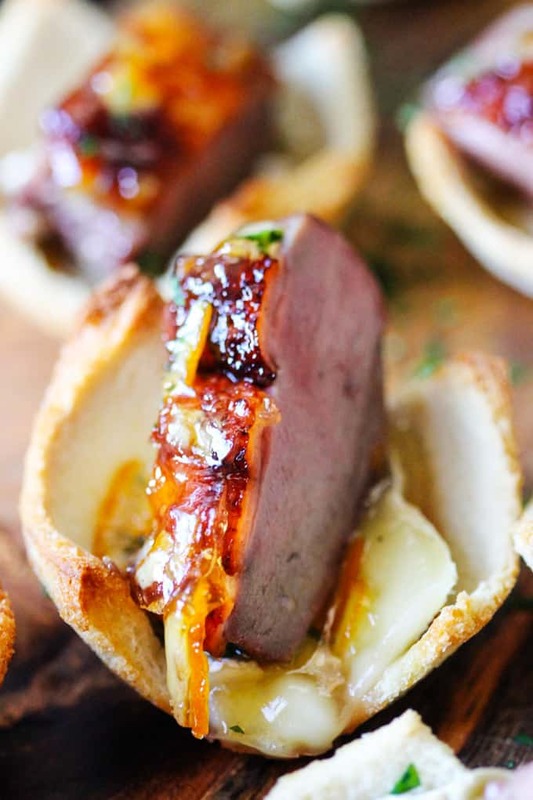 They are full of flavor with Stash Lemon Ginger Tea infused duck breast, seared to perfection, smothered with Lemon Ginger Tea Orange Glaze and topped on the melted brie toasts for the ultimate bite. Combine all the brine ingredients and let them cool off. Then place the duck breasts into a Ziploc bag, pour in the brine, close it, place in a bowl, and refrigerate overnight. The next day you will have to remove the duck breast from the brine a few hours before cooking, pat them dry. Place them onto a plate to the refrigerator, uncovered, to let the skin dry (this is an important step if you want to achieve a crispy skin on your duck breast). Steep 1 tea bag of Lemon and Ginger Tea in half a cup of water. ..Cook it for approximately 15-20 minutes on low heat, until the glaze sticks to the back of your spoon and most of the liquid has evaporated (by the way, this glaze is really amazing; it's sweet, spicy and infused with Lemon Ginger taste of Stash Tea). Add half a cup of orange marmalade. Cook it for approximately 15-20 minutes on low heat, until the glaze sticks to the back of your spoon and most of the liquid has evaporated (by the way, this glaze is really amazing; it's sweet, spicy and infused with Lemon Ginger taste of Stash Tea). Score the Duck Skin. First, be careful to only score the skin but not the meat. You need to do this in order to let the fat render out from the skin. If you skip this step you will end up with chewy, soggy duck skin (and nobody wants that!). Preheat the oven to 400 F.
Place your duck breast skin side down on a cold, cast iron or stainless steel skillet. Yes, you heard me right. The skillet needs to be cold! Turn the heat on your stove to medium and set a timer for 12 minutes (if your breasts are less than a 1/2 lb, but if they weight more than you can set a timer for up to 15 minutes). Do not touch the meat for the entire time. Once the timer is up, flip the meat and cook on the other side for 1 minute. Smother each breast with Lemon Ginger Tea Orange Glaze and place it in the oven for 5-6 minutes (under 1/2 lb for 5 minutes, over 1/2 lbs for 6 minutes). Remove from the oven and let it rest for 10 minutes before carving. Remove the bread from the oven. Slice up your duck breast in 1/2 inch slices. 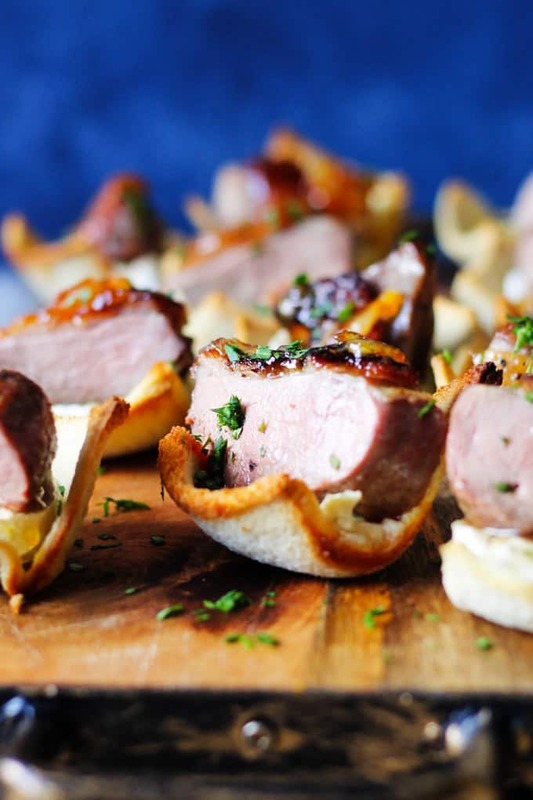 Add 1/2 a teaspoon of orange marmalade to each cup, top it with Lemon Ginger Tea Orange Glazed Duck Breast slice; sprinkle all with some parsley and serve. Enjoy! Tried this recipe?Show me @eatingeuropean or tag #eatingeuropean! 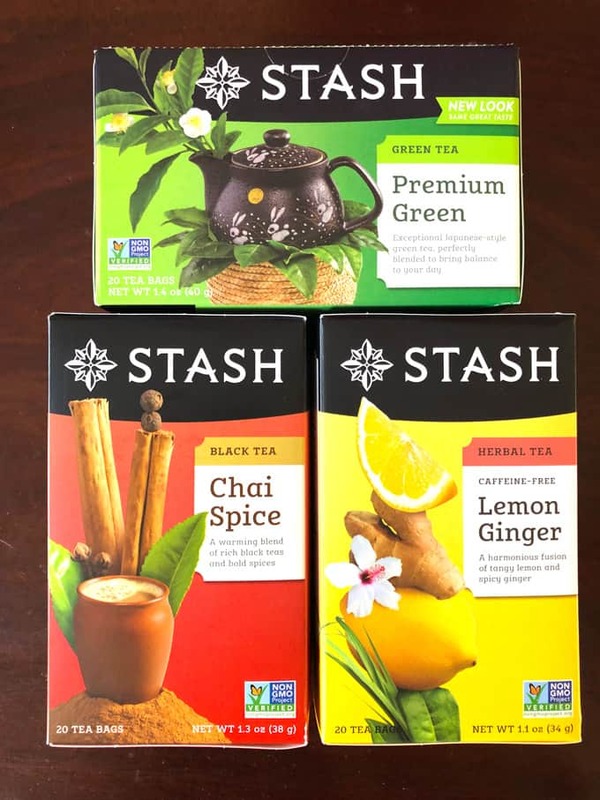 For more information on Stash Tea please visit their website or check their social media: FACEBOOK / TWITTER/ INSTAGRAM/ PINTEREST. Read about the author Edyta here or follow Eating European on social media: Facebook, Instagram, Pinterest, and Twitter. Oh wow! 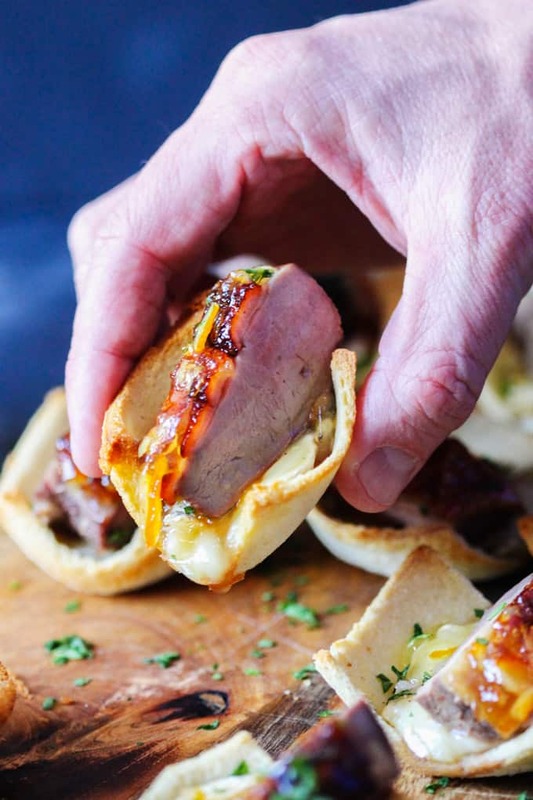 These look like the perfect party appetizer! 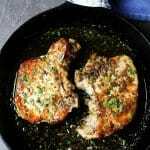 I’ve brined pork chops before but never duck breasts, I’m definitely going to have to try it. Especially with the tea – what a great way to add flavour! Everyone loved it! It was a huge hit! 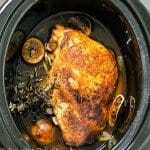 I don’t normally buy duck because it is hard to find but this recipe has changed my mind! I can not wait to try this with all those flavors! Thanks for sharing! I’ve never thought about using tea as a marinade, such a unique and tasty idea! Hi, I'm Edyta. I’m a recipe developer, photographer and the writer behind the Eating European food blog of European and Mediterranean healthy and delicious recipes. I consider myself a home chef with cultivated passion for amazing food.